Footage from the onboard cameras in a fatal self-driving car crash Sunday night show the pedestrian crossing the street moments before the crash. 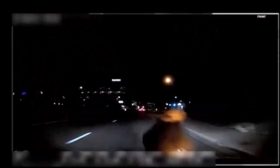 Video taken from onboard cameras in a fatal self-driving car crash in Arizona Sunday night shows the operator did not have his eyes on the road and the pedestrian was visible for at least a second before the crash occurred. The video paints a different picture than the one from some recent news stories, which exonerated the person behind the wheel based on an interview with the local police chief. "While we recognize two media outlets have attributed exclusive interviews with the chief, we respectfully disagree with how their claim of interviews have been characterized," Sgt. Ronald Elcock, a spokesman for Tempe police, said in a statement. Following the Sunday night crash involving an Uber test vehicle operating in autonomous mode in Tempe that killed 49-year-old Elaine Herzberg, the San Francisco Chronicle quoted local police chief Sylvia Moir saying Herzberg had abruptly moved in front of the car, and it would be "difficult to avoid this collision in any kind of mode." In a press conference Monday, Elcock said the vehicle was traveling at 65 km/h (40 mph) with no signs of slowing down. The safety driver, 44-year-old Rafael Vasquez, was looking down for most of the 10 seconds leading up to the crash, according to the video. "The video is disturbing and heartbreaking to watch, and our thoughts continue to be with Elaine's loved ones," said an Uber spokeswoman in a statement. "Our cars remain grounded, and we're assisting local, state and federal authorities in any way we can." An Automotive News analysis of time codes on the video, using Quicktime, show Herzberg’s sneakers come into view at the 2.9-second mark and the crash occurs after the 4.1-second mark. The video does not show the crash itself. Herzberg's death is believed to be the first caused by a vehicle intended to be fully self-driving. Along with Tempe police, NHTSA and the National Transportation Safety Board are investigating the crash. Determining who is at fault could have ripple effects across the industry as companies and regulators decide how to deploy the technology. Elcock said once the investigation is finished, Tempe police will submit the case to the Maricopa County Attorney's Office, who will decide if charges will be filed. Some autonomous vehicle developers have pushed pause in the wake of the fatality. Uber has suspended tests in Arizona, California, Pittsburgh and Toronto, and Toyota Motor Corp. and NuTonomy, a self-driving subsidiary of Aptiv, have also halted public road testing.